In my opinion fall means a few things, bonfires, sweatshirts, and cozy soups. I’ve made 2 batches of this so far and you can bet I’ll make it again. Yes, it’s that good. Shall we? Thanks to a family of avid gardeners, we always have seasonal produce in the growing months. In Indiana, that is usually June to October. This squash came from my moms and I’ve got 5 more sitting on my counter. I cannot wait to eat them all. You’ll be happy to know that this recipe is super simple. Cook the ingredients, add them to a blender, puree, and pour it in a bowl. That’s it. 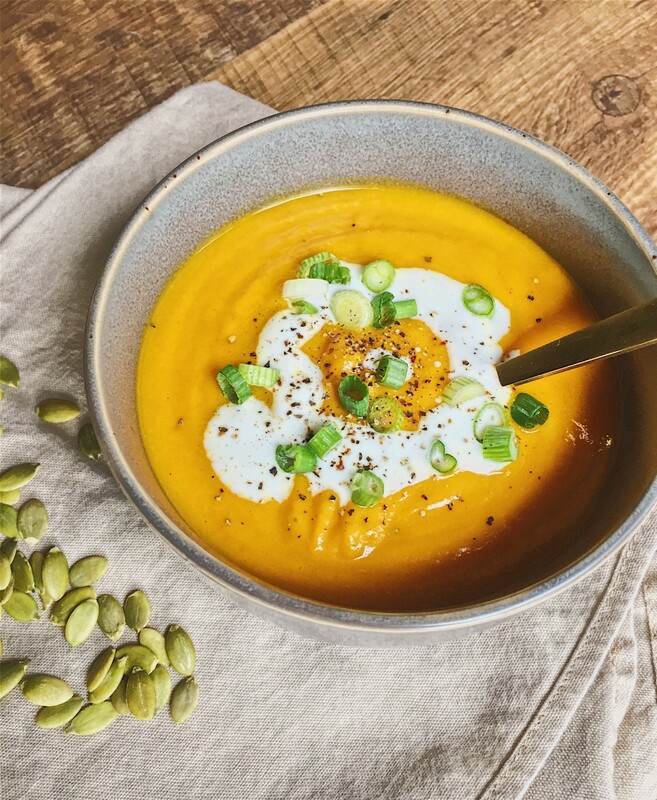 For this recipe you will need butternut squash, onion, garlic cloves, vegetable stock, chipotle in adobo, and maple syrup to taste. To start, preheat the oven to 400 degrees. Halve the squash and take out the seeds. Place both halves on a baking tray lined with parchment paper. Put a little bit of olive oil and salt and pepper on it and roast in the oven for an hour and 20 minutes until golden and caramelized. This is what it should look like when it come out. 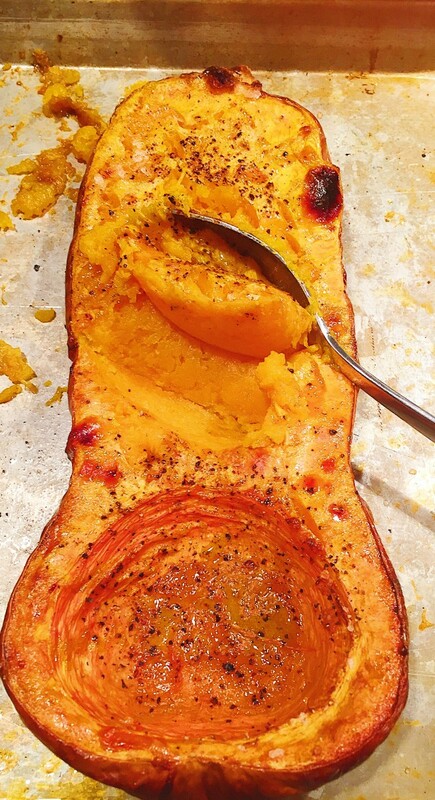 Test the squash with a fork or a knife and it should have the consistency of butter and be easily spooned out. Once taken out of the oven, let it cool. Try not to eat it at this stage because we have greater plans for this guy, the soup remember? I understand if you sneak a bite, though. Meanwhile, sweat the onions until translucent and caramelized. Once done, remove from the pan and add the garlic and cook until just done. Guess what? The cooking part is done. How easy was that? Now its time to start turning these ingredients into soup. It’s time to grab your blender. 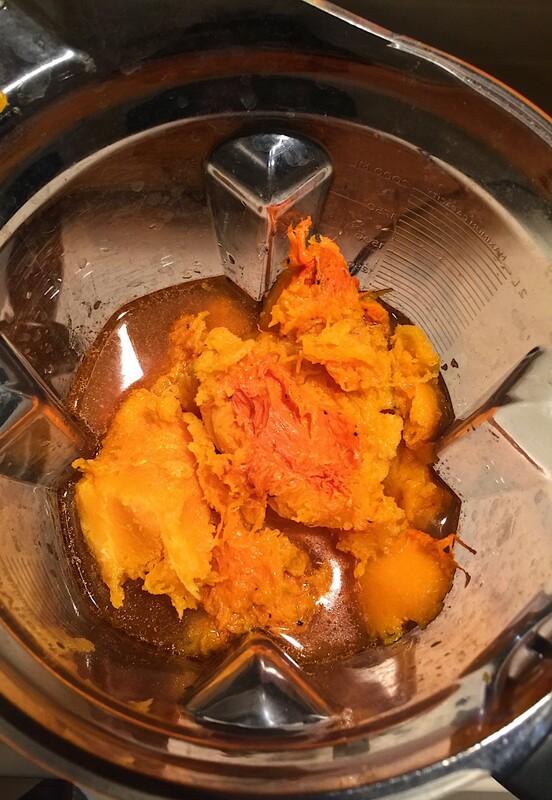 When blending, you always want to add the liquid first so that as the ingredients blend, the liquid can be pushed up from the bottom of the blender to incorporate the rest of the ingredients. By putting the liquid in first, you don’t get pieces stuck on the bottom under the blade which would ultimately prevent a smooth consistency. That being said, add your vegetable stock to the blender, followed by the squash, onions and garlic, and lastly a chipotle pepper. Blend until smooth. At this point, taste for seasoning. Is it spicy or smokey enough? If not, add another chipotle. Does it need salt for more depth of flavor or maple syrup for sweetness? It’s your personal preference here. If you have a blender that has a soup setting, use that. If not, once your desired consistency is reached, you will need to pour it into a pot to heat through or you could pour it in a bowl and heat the soup individually. The toppings on this soup are the part where you can get creative. I experimented with several options such as canned coconut milk, pepitas, shredded coconut, scallions, black pepper, and croutons. They are all excellent choices, it just comes down to your preference. Whatever your choose, you can’t go wrong, I promise you. Halve the squash and remove the seeds. 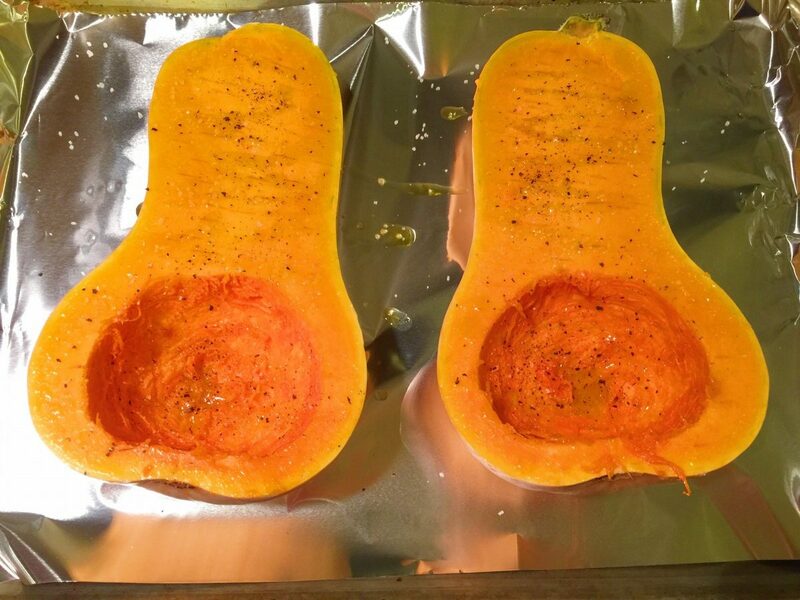 Place on a sheet pan on parchment paper or aluminum foil and add olive oil, salt and pepper and prick the squash with a fork. Roast for 80 minutes. If it looks cooked and caramelized, test with a fork for doneness. If done, remove from the oven and let cool. 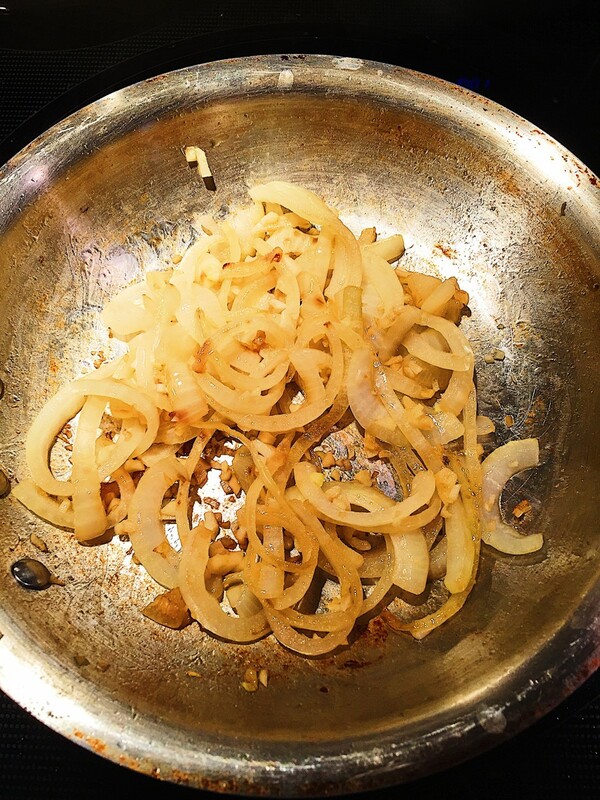 Cook the onions first until slightly caramelized and a golden color is achieved. Remove from the pan and add the garlic and cook. Be sure to not get any color on the garlic. Add the vegetable stock to the blender first followed by the rest of the ingredients. Blend until smooth. Reheat in a pot or in the microwave if your blender does not have a soup setting. Topping choices: scallions, canned coconut milk, pepitas, croutons, shredded coconut, fresh ground pepper. If you want the soup to be thinner, add more stock. If you want it to be more spicy, add another chipotle. If you want added sweetness, don't be afraid to add maple syrup. I am making again today and sending this recipe to my brother in Iowa. Wonderful.